Whether you’ve outgrown your current hard drive or you want more space for Time Machine to stretch its legs, OWC’s Mercury Elite-AL Pro is worthy of your consideration. Featuring quad ports—USB 2.0, FireWire 400 and 800, and a speedy eSATA (external SATA) connector—the Mercury Elite delivers blazing speeds and a massive 1TB of storage. However, all of these features do come at a price. The drive sits in the same hard-disk enclosure as OWC’s 500GB model ( ). Besides its 500GB and 1TB versions, the same drive is also available in 250GB, 320GB, 400GB, and 750GB capacities. Like its predecessor, the 1TB model features a sleek-looking silver enclosure with a perforated grill faceplate, a metal clip stand for placing it vertically, a full-size USB port on the back, and dual FireWire 800 ports so you can connect multiple devices. The drive doesn’t include an antitheft slot or any manuals, but it does come bundled with Prosoft’s Data Backup software ( ) and Intech’s Hard Disk SpeedTools ($90). To get up and running, simply plug the drive into any one of the four types of ports and turn on the power. 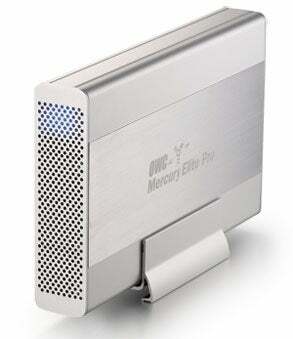 The drive mounts immediately, as it ships already formatted for your Mac. To eke the most performance from the drive, you’ll want to connect to it via the eSATA port, though this requires a separate interface card (not included) for your Mac. These are available for purchase from OWC. In tests using the FireWire 400 and 800 ports, we found the Mercury Elite 1TB to be a speedy performer, beating out other recently reviewed drives with similar capacities. However, at $420, it’s not as cheap as other 1TB drives, such as the Western Digital My Book Studio Edition with quad interface ( ) or the SimpleTech USB 2.0 ( ), which features fewer ports. The Mercury Elite-AL Pro (1TB) certainly delivers on performance and versatility, but it’s also fairly pricey. If you’re hoping to save a little cash, you might want to look elsewhere.